Estimating the engagement is critical for human–robot interaction. Engagement measures typically rely on the dynamics of the social signals exchanged by the partners, especially speech and gaze. However, the dynamics of these signals are likely to be influenced by individual and social factors, such as personality traits, as it is well documented that they critically influence how two humans interact with each other. Here, we assess the influence of two factors, namely extroversion and negative attitude toward robots, on speech and gaze during a cooperative task, where a human must physically manipulate a robot to assemble an object. We evaluate if the score of extroversion and negative attitude towards robots co-variate with the duration and frequency of gaze and speech cues. The experiments were carried out with the humanoid robot iCub and N = 56 adult participants. 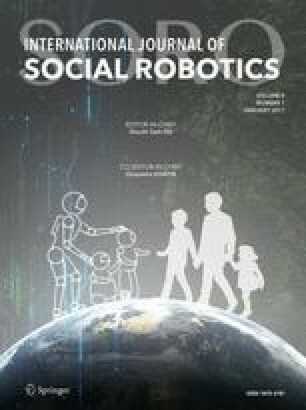 We found that the more people are extrovert, the more and longer they tend to talk with the robot; and the more people have a negative attitude towards robots, the less they will look at the robot face and the more they will look at the robot hands where the assembly and the contacts occur. Our results confirm and provide evidence that the engagement models classically used in human–robot interaction should take into account attitudes and personality traits. The authors wish to thank Charles Ballarini for his contribution in software and experiments, Salvatore Anzalone and Ilaria Gaudiello for their contribution to the design of the experimental protocol. This work was performed within the Project EDHHI of Labex SMART (ANR-11-LABX-65) supported by French state funds managed by the ANR within the Investissements d’Avenir programme under reference ANR-11-IDEX-0004-02. The work was partially supported by the FP7 EU projects CoDyCo (No. 600716 ICT 2011.2.1 Cognitive Systems and Robotics). See Table 6 for the questions in English and French. See Table 7 for the questions in English and French. The WoZ GUI was organized in several tabs, each dedicated to a specific task, such as controlling the robot movements (gaze, hands movements, posture), its speech, its face expressions etc. The GUI events are elaborated by the actionServer module and others developed by the authors in previous studies [27, 28]. All the developed software is open source18. Figure 11a shows the tab related to the control of head gaze and hands movements. It is designed to control the gaze direction in the Cartesian space, with relative movements with respect to the fixation position (joints at zero degrees in both eyes and neck). The hands can be quickly controlled by a list of available pre-defined grasps, plus primitives for rotating the palm orientation (towards the ground, skywards, facing each other). It is also possible to control the hand position and orientation in the Cartesian space, providing relative movements with respect to the current position with respect to the Cartesian base frame of the robot (the origin located at the base of the torso, with x-axis pointing backward, y-axis pointing towards the right side of the robot and z-axis pointing towards the robot head). Some buttons allow the operator to control the whole posture of the robot and bring it back to pre-defined configurations. Figure 11b shows the part of the GUI dedicated to switching the control mode of the arms: position, zero-torque, then impedance with high, medium and low stiffness. The default values of the module demoForceControl 19 for stiffness and damping were used. During the experiments, the arms were controlled in the “medium compliance” impedance mode, which allows the robot to exhibit a good compliance in case of unexpected contacts with the human participant. When the participant had grabbed the robot arms to start the teaching movement, the operator switched the control to zero-torque, which made the arms move under the effect of the human guidance. Figure 12a shows the tab related to the robot’s speech. It is designed to quickly choose choose one among a list of pre-defined sentences and expressions, in one of the supported languages (currently French or English). It is also possible to generate new sentences, that can be typed on-the-fly by the operator: this is done to allow the operator to quickly formulate an answer to an unexpected request of the participant. The operator can switch between the supported languages, but of course in the experiments of this paper the robot was always speaking French (as all the participants were native french speakers). The text-to-speech in English is generated by the festival library, while in French by the Pico library. Figure 12b shows the tab related to facial expressions. The list of facial expressions along with their specific realization on the iCub face (the combination of the activation of the LEDs in eyelids and mouth) is loaded from a configuration file that was designed by the experimenter.